Not sure if this is what the kids are doing these days, but back when I was in grade school, a good deed resulted in a shiny gold star sticker next to our name on the wall. Competition, be it for punctuality, completed homework or otherwise, was fierce. Much pride was to be had from a job well done. 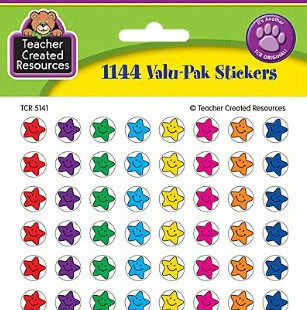 Thirty-ahem years later, it turns out, the star stickers still work for me. In an effort to build some new habits, including regular exercise, eating healthy and practicing guitar, I’m keeping track of my daily progress with, you guessed it, star stickers. This time, they’re on a monthly wall calendar. A different colored sticker for each new habit, received each day I do each good deed. Beyond the cool factor of seeing progress and showing off to friends and family who visit, there’s an important subtlety at work. At least for me, it’s fairly easy to kid myself about how well I’m following a diet or other goal. I tell myself , “Self, I followed my diet most of last week, so this Peanut Butter Cup Perfection® from Cold Stone isn’t a big deal.” Whew. And it tastes so good. In reality of course, I took a bite here of my wife’s cheesy nacho goodness, a sample at the grocery store of some cream puff thingee, and of course that In ‘n Out Double-Double® for lunch last Wednesday. I’m not willing to deny myself these wondrous gastronomical inventions, just wanting to limit this off-the-diet fun. By defining my eating rules, such as only one cheat-meal per week, and then measuring my actions via star stickers, there’s no kidding myself. It’s all right there on the photo calendar next to the picture of my beloved. If there’s more than one day per week missing a blue star, I didn’t follow the diet. They say that new habits take a few months of daily repetition before they sink in. One month into my new diet, exercise and guitar practice, I’m happy to say, the stars are bright.